Require 15% of a new building’s units be affordable to households making 60% area median income. Require 10% of a new building’s units be affordable to households at 60% AMI. Require 5% of a new building’s units be affordable to households at 60% AMI. The authors of a city-commissioned study on inclusionary zoning, consultants from a group called Grounded Solutions Network, landed on 10% as the sweet spot. You might be wondering, why not require 30% affordable? Why not 100% affordable? Because, in the opinion of the city’s outside experts, a 15% mandate is “the very outer limit maximum of what we could possibly consider feasible.” Anything higher makes it very difficult for a profit-seeking enterprise to build apartments. The experts explained why a mandatory, not voluntary, system was the right path for Minneapolis. Offering developers density bonuses or parking reductions in exchange for affordability doesn’t work because the city has already implemented relatively aggressive parking reforms and has virtually no density restrictions downtown (an area that in recent years has added a lot of units — making it the kind of place where inclusionary zoning could make a big impact). 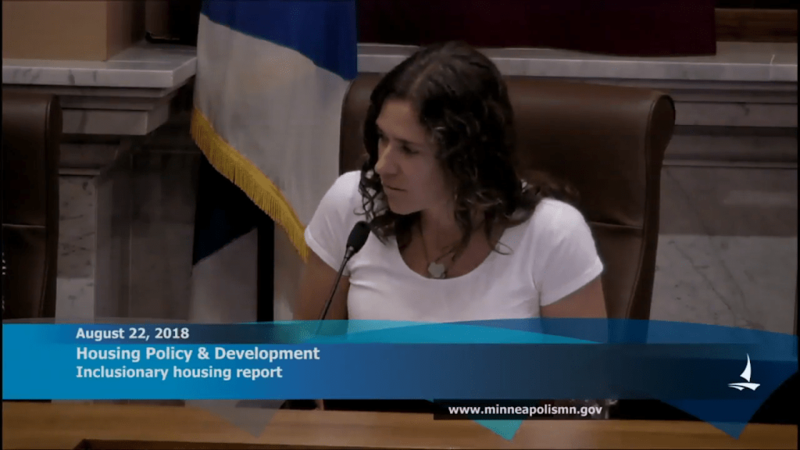 An inclusionary zoning ordinance is something that Council President Lisa Bender has said must be passed alongside the package of zoning reforms contained in the Minneapolis 2040 comprehensive plan. I expect she has the votes to back it up. If City Council approval of a bold version of Minneapolis 2040 hinges on inclusionary zoning, it’s worth thinking about what that debate looks like. those who think for-profit multifamily housing construction is bad, and that stopping it is good. those who think building an apartment building is wildly more profitable in percentage terms than it actually is. The argument from skeptics is that affordable housing is everyone’s burden to shoulder, not just residents of newly constructed apartments and condos. The skeptics say: tax everyone to pay for affordable housing. The owner of a million dollar home in Ward 13 has as much obligation as the renter living in a $1200 Whittier apartment, or the owner of a $500,000 condo. Someone tweeted at me yesterday that the key to inclusionary zoning’s popularity is that it puts the burden on a small and often disliked constituency: residents of apartment buildings that haven’t yet been built. Inclusionary zoning supporters on the City Council will probably latch on to something resembling the case made by the group of experts the city hired to study the issue. Those experts are recommending an affordability requirement that gives developers a choice: 1) 10% of units affordable at 60% AMI or 2) a subsidy to go to 20% of units affordable at 50% AMI. The city’s experts contend that development would remain feasible in most parts of the city under this system. The experts also say that while the cost of a new inclusionary zoning regime will initially eat into the profits of individual projects — making new home construction less likely — landowners would eventually start to bear those costs: “Over time, developers who all face the same increased cost will all negotiate for a lower land price.” This would take years, however. A few alternative scenarios specifically not recommended by the experts would involve the “politically fraught” process of drawing lines on a map to designate the parts of town with strong enough housing markets to bear more stringent affordability mandates. You can imagine how this might upset a landowner just barely on the wrong side of one of these lines on a map. The city-commissioned report on inclusionary zoning is set to be finished in a few weeks. For more detail on yesterday’s presentation to the Housing Policy and Development Committee, see my Twitter thread here. Next PostNext My statement on the legal process to defend Wedge LIVE!